Although the text is hard to read, it is easy to see how this "Confutation" was arranged. Notes and Comments from the Rheims Bible were printed in the sections whose label begins "RHEM." Fulk's reply is printed beneath. The arguments presented in the last example on this page — RHEM.3 and FULKE3 — are typical of the content of this part of the Bible. The Scripture that is being commented on is Ephesians 2:20, where it says that the Church is "built upon the foundation of Apostles and Prophets". 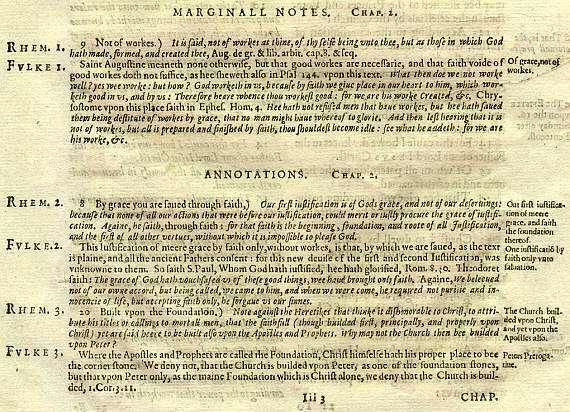 The Catholic Note as seen in RHEM.3 begins "Note against the Heretics ..." — heretics meaning Protestants. It then goes on to say that if the Church is built upon the Apostles, "why may not the Church then be built upon Peter?" — referring to Apostolic Succession and the institution of a Pope. Fulke replies "We deny not that the Church is built upon Peter, as one of the foundation stones; but ... upon Peter only, as the main foundation ... we deny that the Church is built."